Knopf Publishing Group, 9780307596857, 304pp. 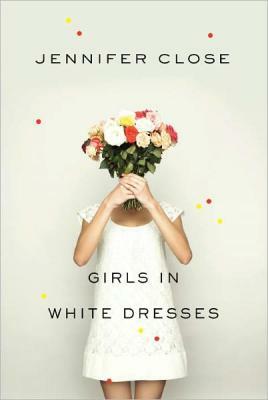 Wickedly hilarious and utterly recognizable, Girls in White Dresses tells the story of three women grappling with heartbreak and career change, family pressure and new love all while suffering through an endless round of weddings and bridal showers. Isabella, Mary, and Lauren feel like everyone they know is getting married. On Sunday after Sunday, at bridal shower after bridal shower, they coo over toasters, collect ribbons and wrapping paper, eat minuscule sandwiches and doll-sized cakes. They wear pastel dresses and drink champagne by the case, but amid the celebration these women have their own lives to contend with: Isabella is working at a mailing-list company, dizzy with the mixed signals of a boss who claims she's on a diet but has Isabella file all morning if she forgets to bring her a chocolate muffin. Mary thinks she might cry with happiness when she finally meets a nice guy who loves his mother, only to realize he ll never love Mary quite as much. And Lauren, a waitress at a Midtown bar, swears up and down she won t fall for the sleazy bartender a promise that his dirty blond curls and perfect vodka sodas make hard to keep. With a wry sense of humor, Jennifer Close brings us through those thrilling, bewildering, what-on-earth-am-I-going-to-do-with-my-life years of early adulthood. These are the years when everyone else seems to have a plan, a great job, and an appropriate boyfriend, while Isabella has a blind date with a gay man, Mary has a crush on her boss, and Lauren has a goldfish named Willard. Through boozy family holidays and disastrous ski vacations, relationships lost to politics and relationships found in pet stores, Girls in White Dresses pulls us deep inside the circle of these friends, perfectly capturing the wild frustrations and soaring joys of modern life. Jennifer Close was born and raised on the North Shore of Chicago. She is a graduate of Boston College and received her MFA in Fiction Writing from The New School in 2005. She worked in New York in magazines for many years and then in Washington, D.C., as a bookseller. Girls in White Dresses is her first book.